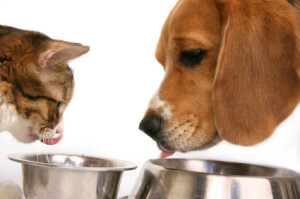 If your canine companion is more family member than pet, you may be in the habit of sharing the foods your family loves with him. Maybe even (accidentally or intentionally) your Halloween candy. Although some people foods are fine in moderation, this is definitely not the case with chocolate! Chocolate can sicken and even kill dogs, and it is one of the most common causes of canine poisoning. While the occasional chocolate chip within one cookie may not be an issue, we worry about certain types of chocolate – the less sweet and the darker the chocolate, the more toxic it is to your pet. Baker’s chocolate and dark chocolate pose the biggest problem. Other sources include chewable, flavored multi-vitamins, baked goods, or chocolate-covered espresso beans. The chemical toxicity is due to a methylxanthine (like theobromine), and results in vomiting, diarrhea, hyperactivity, inflammation of the pancreas (i.e., pancreatitis), an abnormal heart rhythm, seizures, and rarely, even death. With Halloween right around the corner, make sure your kids know to hide the stash from your dogs. (Dogs make up 95% of all our chocolate calls, as cats are usually too discriminating to eat chocolate!) In smaller dogs, even the wrappers from candy can result in a secondary obstruction in the stomach or intestines. It’s the dose that makes the poison! Pets that ingest a few M&Ms or 1-2 bites of a chocolate chip cookie are unlikely to develop chocolate poisoning. Ingestions of more than 0.13 ounces per pound of dark or semi-sweet chocolate may cause poisoning. Very young, geriatric and animals with underlying disease must be treated more conservatively as they are more at risk for poisoning than healthy adult animals. Due to the large amount of fat in chocolate, some pets may develop pancreatitis (inflammation of the pancreas) after eating chocolate or baked goods containing chocolate (see fatty foods). Ingestions of small amounts of chocolate may cause mild vomiting and diarrhea. Larger ingestions can cause severe agitation, tachycardia (elevated heart rate), abnormal heart rhythms, tremors, seizures and collapse. Induce vomiting and give multiple doses activated charcoal to decontaminate. Aggressive IV fluids to help with excretion, sedatives to calm the pet, specific heart medications to reduce the heart rate and blood pressure, anti-convulsants for seizures, antacids (such as Pepcid) for stomach discomfort and diarrhea. Theobromine may be reabsorbed across the bladder wall so a urinary catheter or frequent walks are needed to keep the bladder empty. If your pet accidentally eats chocolate please contact your veterinarian immediately. 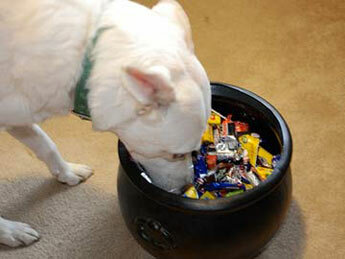 Share the post "Pet Tips: Keep the Halloween candy away from your Pets!"